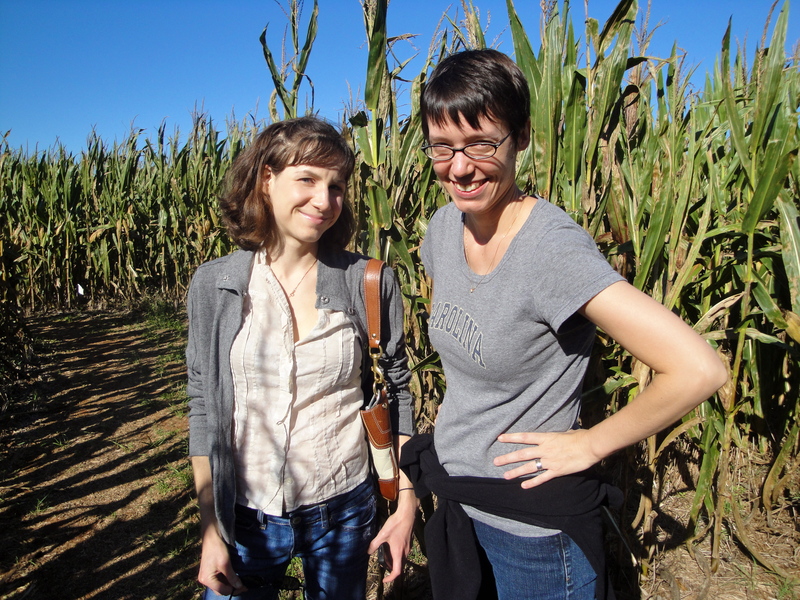 Yesterday some friends and I went to Rougemont, NC (which is just outside of Hillsborough, in Orange County) to go to the McKee’s Cornfield Maze. 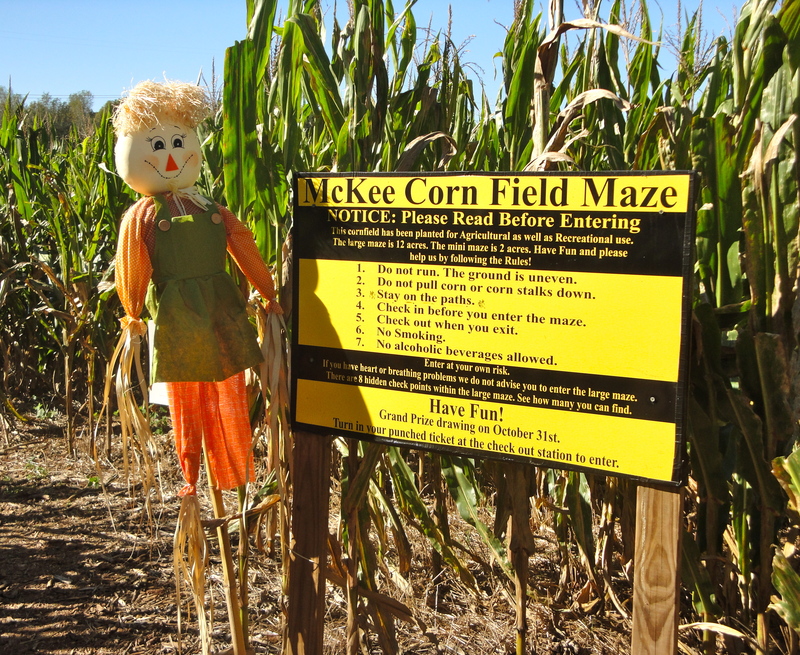 The maze is an annual autumn tradition at the McKee’s Cedar Creek Farm. I hadn’t been to a cornfield maze during my four years of living here, so some friends and I decided it was time to check one out. 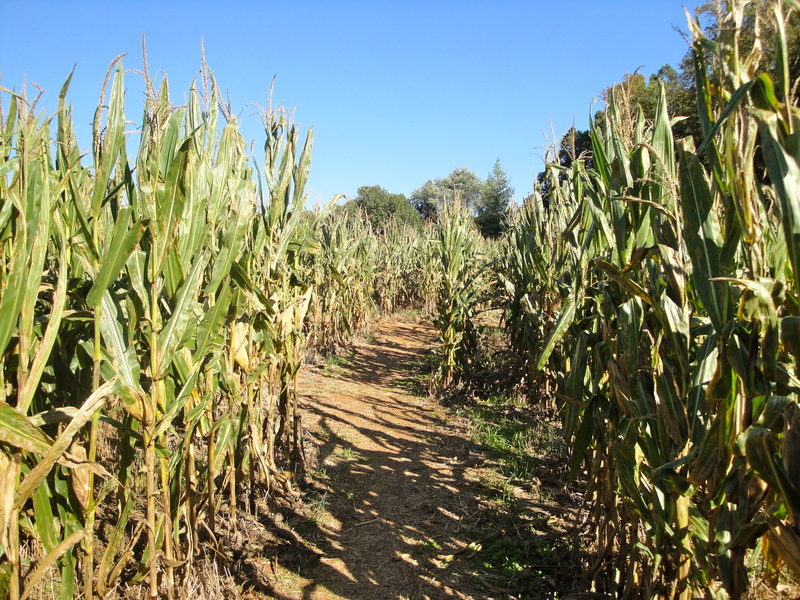 The maze covers twelve acres and consists of four miles of paths through corn fields. Starting in later October the maze becomes a “Haunted Maze” at night, but we went on a beautiful autumn day and there wasn’t a cloud in the sky. We also went on a day they were doing a fundraiser for a local woman who has recently been diagnosed with breast cancer. 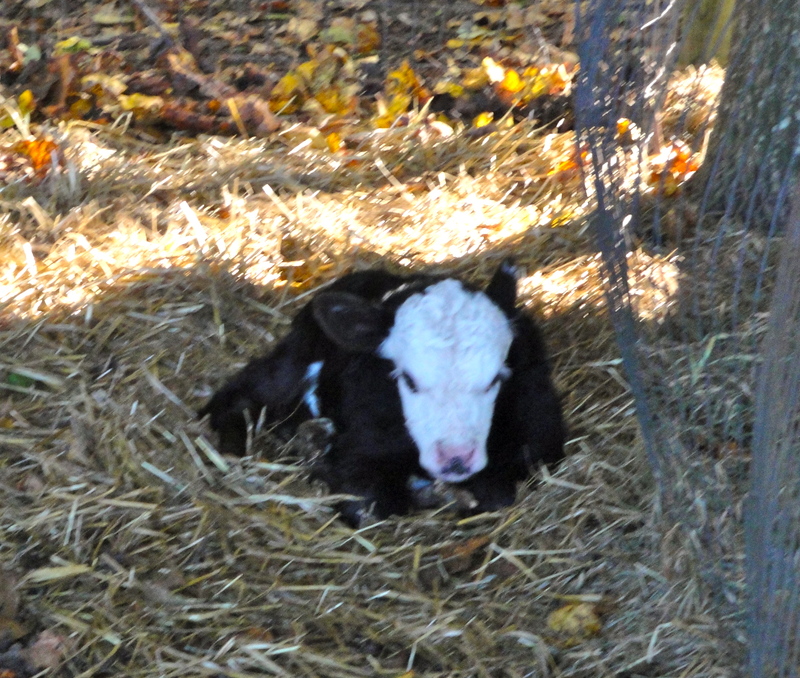 10% of all the day’s proceedswere going to the woman and her family, so yay McKee Farm for being awesome! According to this article about the family in Danvers, Massachusetts that called 911 after fearing they got “lost” in a corn maze at dark (they were only 25 feet from the exit, ha), lots of corn maze designers add extra “challenges” to keep people in the maze longer. This maze was no different. Our tickets had numbers on the bottom, 1-8, and you had to find numbered posts and mark the appropriate numbers with hole punchers. Each hole puncher had a different shape, so no cheating! No prizes if you completed the challenge and no penalties if you did not, it was just something to do. The posts were actually quite difficult to find, and we only discovered four of them. How much longer do we have to spend in this maze? The maze pretty much looked like this. The maze is designed by Vivie McKee, and it always creates a picture when photographed aerially. This year the picture was a man on a tractor, in front of a setting sun and sunflowers, with the words McKee Farm 10 Years or something along those lines scattered about. I love the creativity behind some of her designs! Like I said, I’d never been in a corn maze, but it was pretty much what I expected! We passed people on the trails but we were mostly by ourselves, surrounded by corn, hunting for the various numbered posts. After about forty-five minutes we decided to head to the exit. We actually didn’t go out the intended exit, but went out through the entrance. Oops! 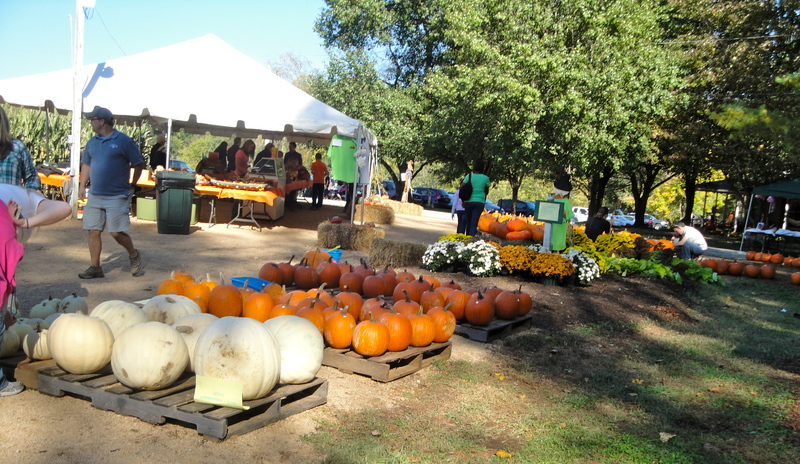 The McKees have a lovely set up outside of the maze, where they sell pumpkins, gourds, fall squash, and mums. Maple View Farms was on hand selling scoops of ice cream, and Tammi and I treated ourselves post-maze. 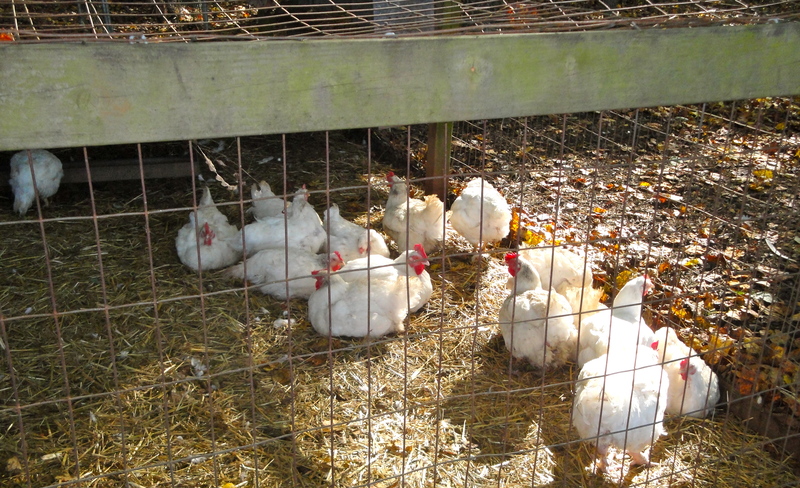 The McKees also had many of their animals out on display for the kids. The day was gorgeous and perfectly fall, and I was happy to spend it outdoors with some friends. 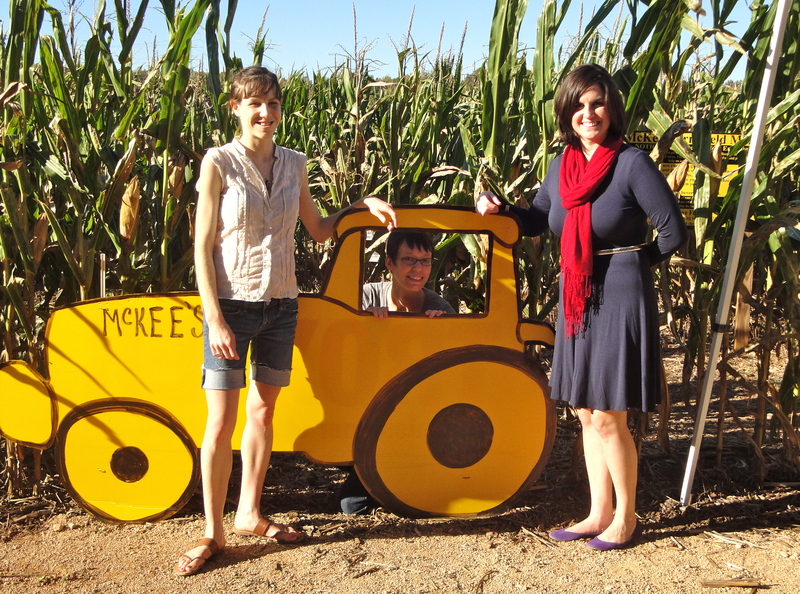 If there’s a corn maze in your area you should check it out, it is a lovely way to spend an afternoon! Tammi also informed us that we were participating in agrotourism, so I was glad to do my part to support Orange County. It is also currently Sukkot, a Jewish harvest holiday, so I feel like I got my Judaism on by hanging out on a farm and observing the harvest. The little things we do. 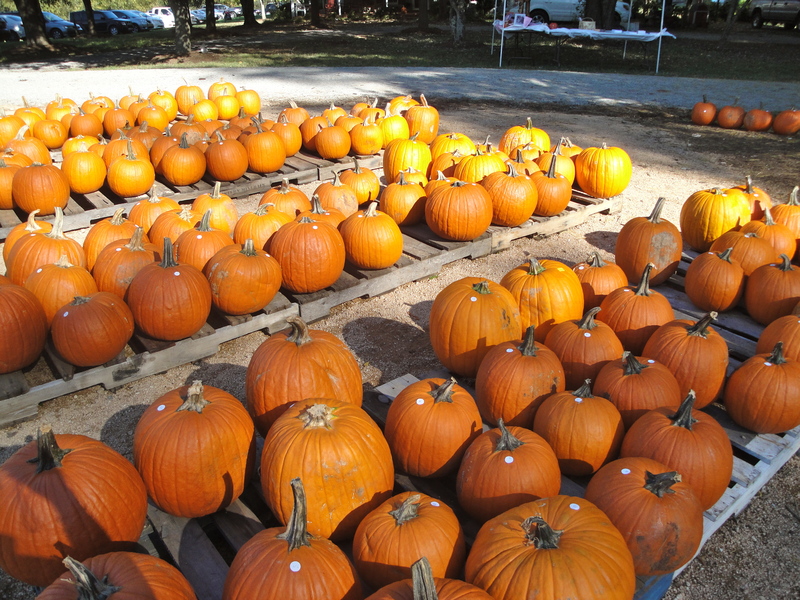 I actually didn’t get a pumpkin from McKee’s but I did buy my pumpkins this weekend, so I’ll hopefully be carving them soon! I hope y’all had as gorgeous of a fall weekend as I did! Can I just say how much I love that goat photo? I know, bizarre. 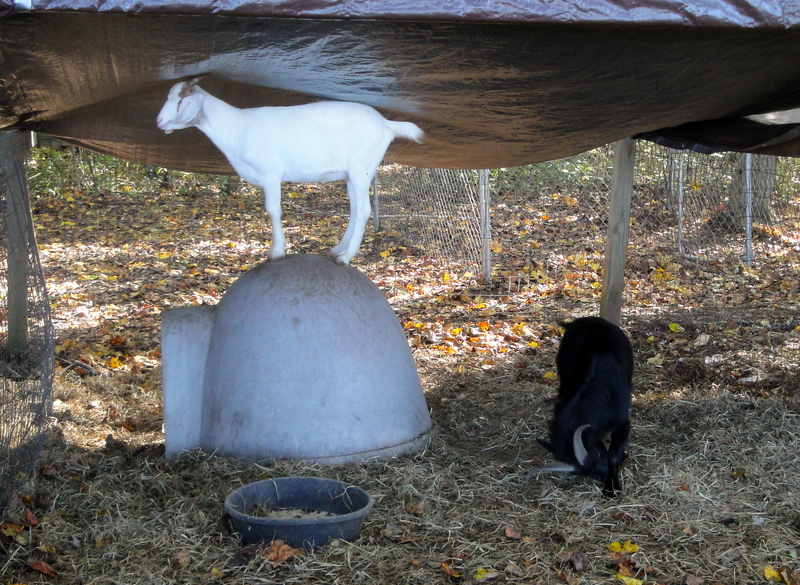 But I have an insane and all-consuming love for goats, and when they stand on top of their little goat houses like that I become giddy. Normally I have to beg Hubby to drive me around looking for goats, so thank you for making my goat coveting activities easy this morning. You rock.